The yam plant grows like a small bush spilling over and tumbling along. As the wind breezes through the yam plants, the seeds and flowers gently move and appear to shimmer. It is this effect that Elizabeth captures in her paintings. The little leaves are used to make a balm to rub into the skin. Elizabeth uses acrylic paint on canvas and paints with the canvas laid flat on the ground. She uses thin satay sticks to make tiny flicks of paint across the canvas, usually using at least three colours. 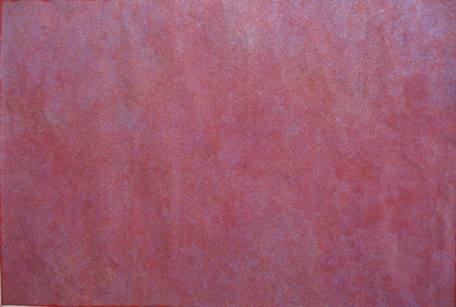 Elizabeth likes to use a coloured ground on the canvas rather than the black often associated with Indigenous painting. Her paintings are lyrical and refined. Elizabeth has been painting seriously for around the last three years. Her husband Cowboy Loy Pwerl also paints.